Here's a sampling of the Landscape Design Projects we've worked on. The challenge with this outdoor space in front of an existing Portland ADU is to maximize usable outdoor area in a small footprint. A double-wide sloped driveway was cut in half and replaced with permeable pavers and a set of low deep steps that act as a terraced entrance to the home. Steel and ipe wood was used in a handcrafted fence, a sleek but sturdy pergola/shading device over the accordion door entry as well in a set of lounge chairs that provide seating for both owners and guests. 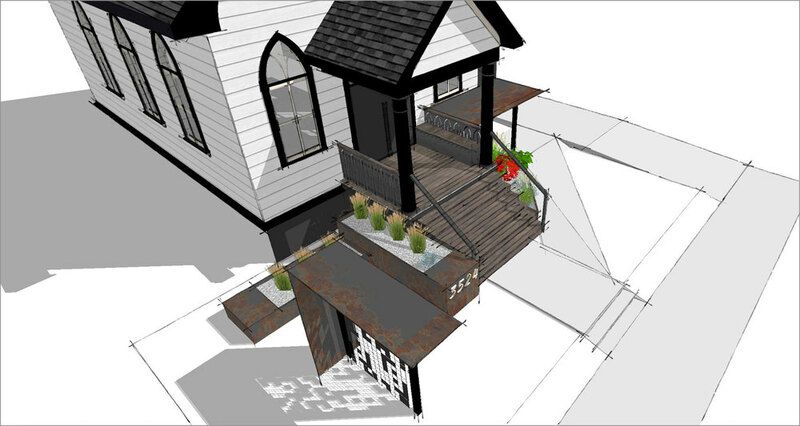 A series of steel planters line the entry steps and are flanked by a concrete retaining wall that provides separation from the driveway/parking area. The private patio behind the fence features a hot tub and eventually a steel chiminea for chilly Portland winters. Our clients have the privilege of in living in an old church. The problem is trying to make that old church converted into a home also look sleek and modern. They hired us to help them re-imagine the approach and entry to their new home and add a new set of materials that can be incorporated both inside and out. We started with a combination of Ipe, which will weather naturally to an beautiful (and no-maintenance) grey and then added some raw steel plates and powdercoated steel structures. The look is sleek and modern, yet protects the original structure with a nod back to the original church use of the structure. 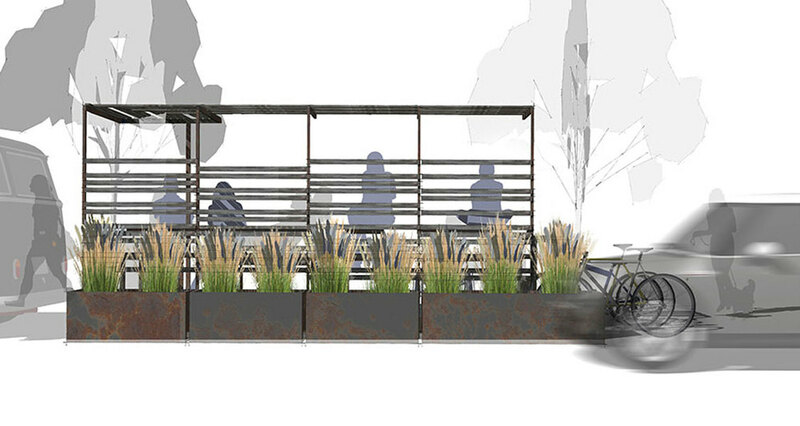 We had a blast with this project and are excited to work with the fabricators and contractors to bring this vision into reality. Our client had a back yard that saw little use but required tons of maintenance. 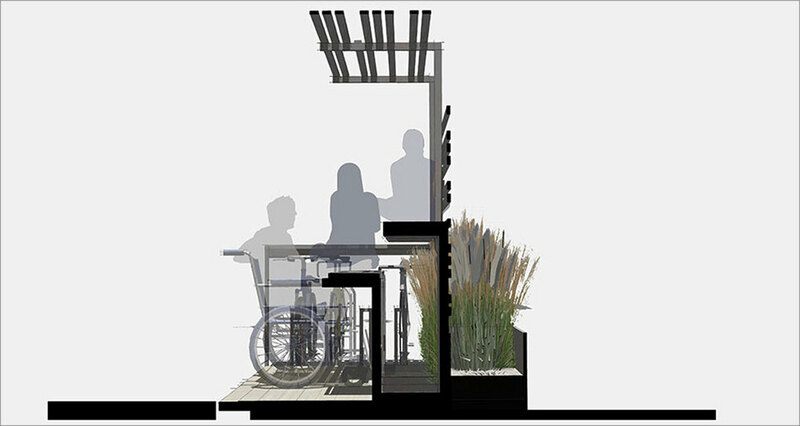 They approached us looking for a design that would allow a covered eating space, a new deck and that would take care of a constant drainage problem in their back yard. They wanted a project they could build in phases as funds allowed. Our solution was a raised pergola that provides respite from both sun and rain with plenty of area for seating and entertaining. 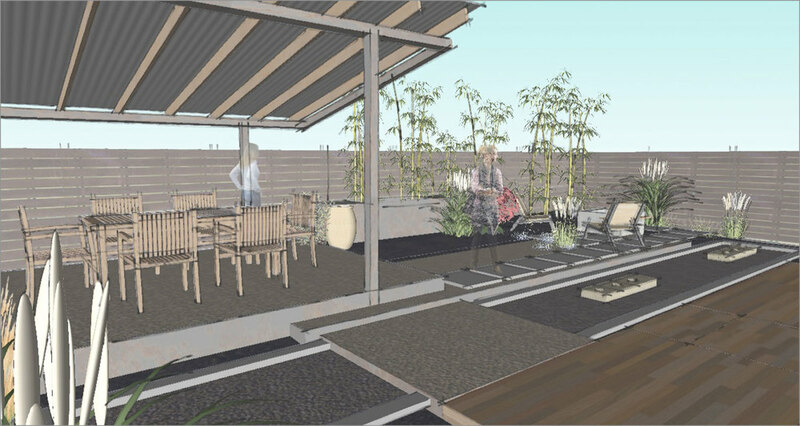 We also designed a new deck and bbq area along the house. Future phases will include a wooden screen behind the bbq to add a bit of privacy to the yard and a sunken firepit/lounge area in the remaining corner of the lot.